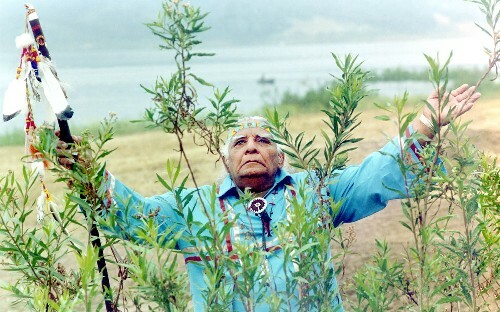 As a Chumash descendant, it is my belief, and that of many other Chumash people, that we have always been on this land. Anthropologists (scholars who study the remains of past societies) do not know for sure when the ancestors of the Chumash arrived in this area. Theories claim that they may have arrived somewhere between 12,000 and 27,000 years ago. Recent studies on human remains that have been in the possession of the Santa Barbara Museum of Natural History have been dated 13,000 years ago. These bones belong to one person, a woman who lived on Santa Rosa Island, one of the islands belonging to the group of islands known as the Channel Islands off the coast of Southern California. This places her as the oldest recorded human being on the North American Continent. Strait, a strip of land from Siberia to Alaska. In the Chumash oral tradition, we have creation stories where the people of the upper world, Mishupashup, created man from a table made of marble and then, after it was decided what kind of hands man should have, he was placed in this world, Itiashup. The decision on the kind of hands for man came about when Snilemun (Sky Coyote) argued with Sun that man should have hands like his; then it was decided. As Snilemun was ready to put his paw down, a lizard ran around behind Snilemun and put down his hand, and with that action, we have hands with fingers instead of paws. Another more modern creation story came out of Santa Barbara around the 1930s “the Rainbow Bridge Story” in which Mother Earth, or Hutash, planted seeds in the ground on the island of Limu, which means “In the Sea” (Santa Cruz Island), and up sprouted these people, strong and handsome. She gave them many gifts, items for them to survive on. When the island became too heavily populated, Hutash called them to the highest point of the island and told them that she was going to make a bridge out of a rainbow and that they were to cross over to a new land. This bridge connected this this land that spreads out for hundreds of miles in all directions. As the story goes, Hutash gave a warning stating that if the people looked down off the bridge, they would fall off and drown in the sea. Some of the people did look down, and as they fell Hutash heard the cries for help, so, out of pity, she turned them into dolphins. So, with these stories in place, we Chumash people believe in these origins. My heritage comes from my father, Vincent Tumamait, and my mother, Lucy Castro Tumamait, whose parents come from Guajuanto, Mexico. They settled in Camarillo. My mother and father married in 1942 at the Mission Santa Barbara and made their home in Ventura. Family stories, baptism records and interviews with anthropologist have helped our family trace our lineage throughout Chumash territory. Our family descends directly from Santa Cruz Island. In 1811, Juan de Jesus Tumamait was baptized in the San Buenaventura Mission, which was established in 1782. He was raised by his grandparents, who were two people among hundreds to be removed from the island to become part of the labor force that built the mission in Ventura. As an adult, Juan de Jesus became a captain for that area, helping maintain order and peace between the native people and the missionaries. He also played a violin in the mission orchestra. As an adult, he took back his native name of Tumamait, which through research we have found to mean “orphan”. He tried to set an example for the other people to tell them that they should not let go of their culture so quickly, but assimilation was rapidly descending upon the people. As a result, our family is the only one who has a Chumash name as a surname. Juan de Jesus was our great-grandfather. Vincent Tumamait. Photo by Juan Carlo. My father Vincent moved us into the Ojai area in 1952. I grew up in the river bottom of Meiners Oaks, off the north end of Rice Road. As a child, I loved this area, being near the river and the mountains. Later, I would learn that our family descended from the people who lived in the village there. Juan de Jesus’ mother, Maria Ricarda (her native name was Alulalmegue, which means “one who drags their feet”), was born here at the village called Matâ’ilha, or as we know it today, Matilija, which means “division”. She was born about 1786. The village proper was situated where the present-day historical Lopez Adobe is; in 1830 it was a fort. In 1925, it was sold to Louise McCaleb. 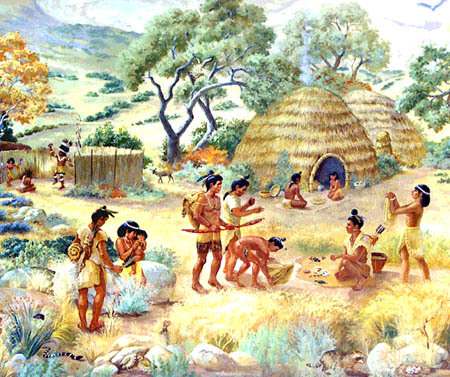 It was in the 1830s that soldiers witnessed the Chumash people, hunting and gathering along the river, making temporary camps and performing ceremonies. Recently, workers were pulling rocks out of a stream bed just up from the former village of Matâlha to use for building a rock wall. One of the workers picked up a rock about the size of a frying pan, and when he turned it over, he saw some painting on it. It turned out to be a ceremonial stone with painted Chumash symbols on it. There has been only one other such stone found and we cannot explain them. This stone was donated to the Santa Barbara Museum of Natural History. Throughout Chumash territory there are select places where cave paintings can be seen. We do not know all there is to know about them, but we do know that these caves are sacred and that visitation is not encouraged. This ceremonial stone was found near a spring, which is consistent with the painted caves. The closest cave that we know of in our area is in a place called Mutah Flats, named after William Mutah, a homesteader who lived in the area of Pine Mountain. This cave is a beautiful example of the intricate designs that the Chumash used to express their visions. One reason that we will never fully understand these symbols is because the person or persons painting these symbols were sometimes under the influence of a hallucinatory drug, a special potion made up of the Datura plant. When drunk, the person went into a coma-like state. Upon awakening, the person would then tell the medicine man, or the “alaqlapsh”, his or her dreams. It is at this point that we lose the knowledge as to who actually painted the symbols. When we take a look at Ojai and its power spots, we have to first acknowledge the great Topa Topas. The name comes form the Chumash word “sitop topo,” which means “much cane.” This type of cane was used for arrows and for small tubes about 2 inches long used to hold tobacco and then the person would pierce it through the ear lobe. The village of “Awhay,” which is where the name Ojai comes from, was situated in the upper valley and, from ethnographic reports, it was said that crystals were gathered from the Topa Topas. Our oral traditions tell us about men who would dress in bear skins and travel from the villages of Sisar (eyelash) Sespe (kneecap) down the grade to villages in the lower valley all the way to the village of Matilija. 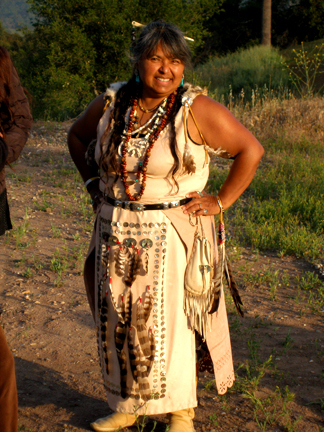 Little is known about the life of the Chumash in the Ojai Valley during the pioneer days. Some of the Chumash became cowboys and ranch hands; others picked the fruit from the orchards. Like my grandparents, they would belong to a family who put them to work on their ranch. Then, when they were finished, they would be “lent” out to another ranch. Very little archaeology has been done in the downtown Ojai area. We all know about the Soule Park Golf Course site; it has no village name, only a number. It is only by looking at the collections at the Ojai Valley Museum that we can get an idea of what was in people’s back yards. When Caltrans was doing trenching along Ojai Avenue near the El Camino Motel [Chantico Inn] and dirt was being loaded on dump trucks, the person monitoring this dig asked to look in the back of the truck. While sifting around with a shovel, a sandstone bowl was found. This bowl would have been used for pounding acorns into flour. My brother and I do monitoring of construction sites, and it is in talking with different men who we are working with that we get a lot of after-the-fact news about village sites that were destroyed, or cemeteries that were plowed through. We heard how Lake Casitas and the Ojai Valley Inn were both built on former village sites. This was at a time when there were no laws in effect to prevent it. Communication with native people wasn’t done then and sensitivities weren’t as strong as they are today. During the Ojai Valley Inn’s new construction, they hired a monitor. When we experience any drought years, people call me to say how artifacts are washing out of the banks at Lake Casitas, but my only concern is that no human remains are being exposed there. A village by the name of Kashomshomoy (kind of animal) was located at the Ojai Honor Farm site (now HELP of Ojai West). When I was a child, we spent a lot of time at Matilija Hot Springs and Wheeler Hot Springs, both have the healing waters that made Ojai famous. The Matilija Hot Springs were discovered in 1873 by J.W. Wilcox, and were purchased by R.M. Brown in 1895. It was sold again in 1877 to a Mr. Gardner who opened it to the public. It remained open for several decades, but in 1988 it was closed to the public. It is now owned by a couple who allows groups to come in, though it is still closed to the public. In my mind, this should always remain a healing place. I always feared the Matilija area for reasons I couldn’t explain to anyone. Through my learning process, I can now explain those feelings. This is a very powerful medicine place, and I feel that people should only enter this place at certain times with great respect. We grew up hearing about Chief Matilija and his group of warriors who tried to fight off the ever-present armies. In the myth, the story goes on to tell of Chief Matilija’s daughter, Amatil, who was very much in love with the handsome warrior, Cocopah. Tragically, he was killed in the final battle. Amatil’s love was so deep and so pure that she she laid upon her lover and there she died. What remained of that love was a beautiful flower with pure white petals symbolizing their love and a yellow center to represent the everlasting brilliance of their love.. We know this flower as the Matilija Poppy. Even though Chief Matilija was a fictional character, his curse still lives on. Many people have asked me about this. I don’t know when it began, but it focuses on the Wheeler Hot Springs several miles up the road from Matilija Hot Springs. The curse states that anyone who uses this land for ill gains shall perish. In our oral stories, we have a special one called “Gain Is All” that talks about the results of too much profit. “A man once played on his four-holed flute: ci winu hayaya, winu winu hayaya, gain or profit, will always exist. He was a very close observer, and he began to study the world. He found conflicts that went so far as people killing one another, and the cause of it all was gain. He stopped playing this flute, put it to his ear, and listened to the world. And he heard that all was gain. Then he played the tune again and listed again, etc. And this is allâ€”the hole in the flute is the pathway to thought. After figuring it all out, the man concluded that profit is the voice of all. All the time, it is a single voice-like humming of the air. Gain is the touchstone of the human heart. This story was published in 1975 by Thomas C. Blackburn in his book December’s Child: A Book of Chumash Oral Narratives. Wheeler Blumberg built a bathhouse at Wheeler’s Hot Springs in 1888. He died in 1906, leaving the place to his daughter and son-in-law Webb Wilcox. It was sold many times and had a number of disasters befall on it. In 1917, five people died in a fire, and a flood in 1935 nearly destroyed it. A mobster was hiding out in one of the cabins when it blew up, killing him. One of the owners in the 1960s committed suicide. The flood of 1969 again put Wheeler’s out of commission for several years. In 1985, as I was visiting the spa, I had just started my shower after a wonderful massage and hot tub, when I heard the sound of a fire engine. I looked out the window and the fire truck was pulling up in the parking lot. You never saw anyone get dressed so quickly! As we ran out of the building and out onto the road, we could see the fire coming down toward us. At the time my now ex-husband was playing in a band at The Wheel bar across the street on Sunday afternoons. Well, this was a Monday when the fire started so all of the band’s equipment was still in the bar. We found some people who were visiting and had them fill their cars with all the instruments to take them down the hill to our house. The hot tub buildings did catch fire, but were not destroyed. The worst tragedy was the death of owner Frank and Evelyn Landucci’s son John in 1987. He and a friend were killed when an oak tree fell on them. It had been hollowed out by the 1985 fire. Wheeler’s is now closed due to a number of financial problems. The latest news that I have heard was that someone wants to turn it into an Indian casino and I’ve been asked if I would be interested in joining up and being a part of it. “No, thank you!” Some people just don’t get it. Wheeler’s has so much power that we will never be able to capture its full potential; we have seen the full potential of its wrath. This place as to remain what it had been for thousands of years, a healing place of humble origins, a place where friends and families can go and be healed. Great respect should be given when thinking of developing the land. When disturbing ancient sites, in some cases, there is retribution. As we come back down the hill along the Ventura River, we come to everyone’s favorite gathering spot. As we talked about earlier, the shell beads that the Chumash made can be found everywhere in this valley, especially after it rains. These beads were made only on Santa Cruz Island, so when found on the mainland, one can say that they were a trade item. The Chumash people would bury the shell beads with the dead. So, when people tell me about the collection of pretty beads they have and where they found them, I have to ask them how their luck and health have been lately. I tell these people that the best thing to do is to go back to the spot and bury what they found, say a prayer, and ask for forgiveness. People who have not heeded the warning often fallen ill and died or they kill themselves. Some may find this superstition, but, you see, we do not have much proof. Somehow man has learned that it is not OK to dig into modern cemeteries, so they don’t. We don’t know what effect that would have on a person. On the other hand, it seems to many that it is OK to go looking for the pretty beads and other things that are considered ceremonial and funeral-related. There are other places we must mention which can occur anywhere; they are prayer spots. We can be walking down a trail and all of a sudden spot a carved stone item. This is an atishwin, a supernatural dream helper obtained by a vision quest and used as a charm. The person who made this fetish is long gone, but, for all we know, his or her power still remains. So, when you find these items, place them back in the ground and say a prayer. One of the reasons I love living here in Ojai is the people and their concern about the land. People here are always ready to put down their hard-earned money to purchase land to be preserved as open space. For me and my descendants, it will be wonderful legacy to be able to learn and know about the ancestral villages and be able to look out over an open meadow instead of a mall. I never tire of hearing your stories, and as we walk the trails throughout these lands they revive images of those who passed before. Thanks! Julie, Thank You for all you do to preserve & protect the Chumash heritage !!! very nice writing, i enjoyed it. I also like to walk in the old places. my friends think i am crazy but i can’t argue with that, sometimes those old souls and whispers make me think iam crazy. but I know im not. animals sure seem to like me. thats a good thing right? For more information about Julie Tumamait-Stenslie, obtain a copy of “Ojai Quarterly” (Winter 2012/2013) magazine which can be found on outdoor racks around the Ojai Valley. I believe there’s such a rack in front of Rite-Aid in Mira Monte. When you obtain a copy, you’ll notice that Julie is featured on the front cover and there’s another great photo of her on page 118 and an article on page 119. Julie: Thanks “Big Time” for sharing! Thank you for being you. Vey nice story, Thank you, Julie. For what it’s worth, I walked Matilija Canyon many years before I was honored to meet you, and strongly felt the presence of many old ones. Thank you for this! And for sharing your knowledge of a culture that shows us how to do things for the long term! More than ever the knowledge is needed and deeply appreciated! in the forever Sacred Ojai Valley. I remember fishing with my uncle, your brother at the closed off hot spings. We were enjoying a very peaceful outing when the sheriff came up and said “your trespassing”. My uncle said “no it’s you that are trespassing on my land”. That statement from a Native American who’s family once owned the land has always stuck with me. The sheriff didn’t know what to say got back in his vehicle and moved on. All of the years I have lived in Ojai and have known you Julie, this is the first time I’ve heard this history. Very interesting stuff. I saw a documentary about the Polynesian people and some archeologist believe they made contact with the Chumash many centuries ago. They make similar canoes and ocean vessels, and the names of them are similar also. There is a lot of similarities between their culture and the Chumash’s. I’m new to Ojai and appreciate the Chumash stories of its origin. From my house I see Chief Mitilija’s profile to the north. There is another reclining profile to the west, remarkable for its yellow rocks, this profile is softer, resembling a woman. Was it associated with princess Amital by the Chumash people. If not, does it have its own legend? I’m confused; how can her family be from someplace down in Mexico and still be Chumash?